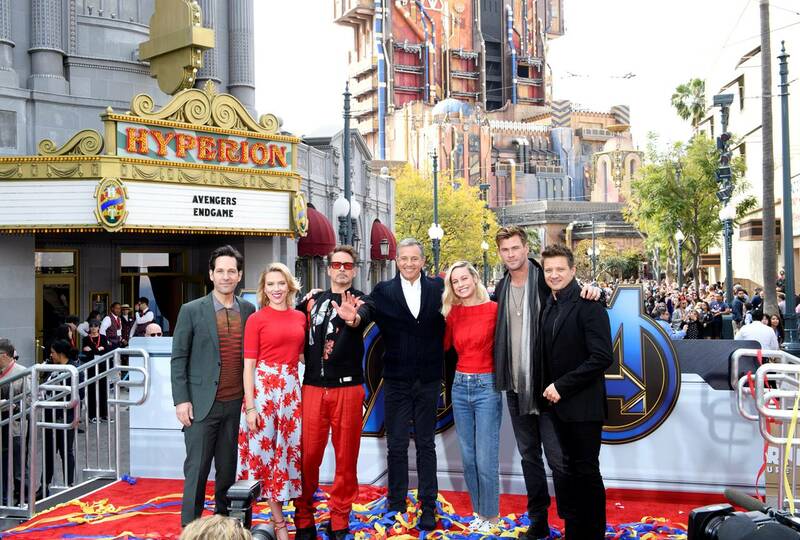 ANAHEIM, CALIF. (April 5, 2019) – The stars of Avengers: Endgame today visited the Disneyland Resort to launch Avengers Universe Unites, a charity event that supports The Walt Disney Company’s signature philanthropic commitment, Disney Team of Heroes, which delivers comfort and inspiration to seriously ill children around the world. From Left: Paul Rudd, Scarlett Johansson, Robert Downey Jr., Bob Iger, Brie Larson, Chris Hemsworth, and Jeremy Renner. Disney Parks, Experiences and Products brings the magic of Disney into the daily lives of families and fans around the world to create magical memories that last a lifetime. When Walt Disney opened Disneyland in Anaheim, California on July 17, 1955, he created a unique destination built around storytelling and immersive experiences, ushering in a new era of family entertainment. More than sixty years later, Disney has grown into one of the world’s leading providers of family travel and leisure experiences, with iconic businesses including six resort destinations with 12 theme parks and 52 resorts in the United States, Europe, and Asia with approximately 160,000 cast members; a top-rated cruise line with four ships and plans for three more to be completed in 2021, 2022, and 2023; a luxurious family beach resort in Hawaii; a popular vacation ownership program; and an award-winning guided family adventure business. Disney’s global consumer products operations include the world’s leading licensing business; the world’s largest children’s print publisher; the world’s largest games licensor across all platforms; more than 200 Disney store locations around the world; and the shopDisney e-commerce platform. Kevin Feige produces “Avengers: Endgame,” and Anthony and Joe Russo are the directors. Louis D’Esposito, Victoria Alonso, Michael Grillo, Trinh Tran, Jon Favreau, James Gunn and Stan Lee are the executive producers, and Christopher Markus & Stephen McFeely wrote the screenplay. “Avengers: Endgame” is in U.S. theaters on April 26, 2019. Disney store, which debuted in 1987, is owned and operated by Disney in North America, Europe, Japan and China. Disney store carries high-quality products, including exclusive product lines that support and promote Disney’s key entertainment initiatives and characters from Disney, Pixar, Star Wars and Marvel. shopDisney.com is the ecommerce destination for guests of all ages, offering a curated selection of the best product from Disney store, Disney Consumer Products licensees, global collections and collaborations, and Disney Parks and Resorts, including trend fashion and accessories, toys, home and collectibles. Disney store and shopDisney offer magical shopping experiences that can only be delivered by Disney, one of the world’s largest and most successful entertainment companies. There are currently more than 215 Disney store locations in North America; more than 40 Disney store locations in Japan;two locations in Shanghai, China including a flagship; and more than 70 Disney store locations in Denmark, France, Germany, Ireland, Italy, Portugal, Spain, and the United Kingdom, plus online stores www.shopdisney.co.uk, www.shopdisney.de, www.shopdisney.es, www.shopdisney.fr, www.shopdisney.it, and www.disneystore.co.jp. Disney store and shopDisney are the retail merchandising arms of Disney Parks, Experiences and Products, the business segment of The Walt Disney Company (NYSE:DIS) and its affiliates that extends the Disney brand to merchandise. For more information, please visit dcpi.disney.com/disney-store or follow us at www.facebook.com/shopDisney, www.instagram.com/shopDisney and www.twitter.com/shopDisney.